Although Bluebells remain an unprotected plant in the Republic of Ireland, in the UK, they are in fact such. 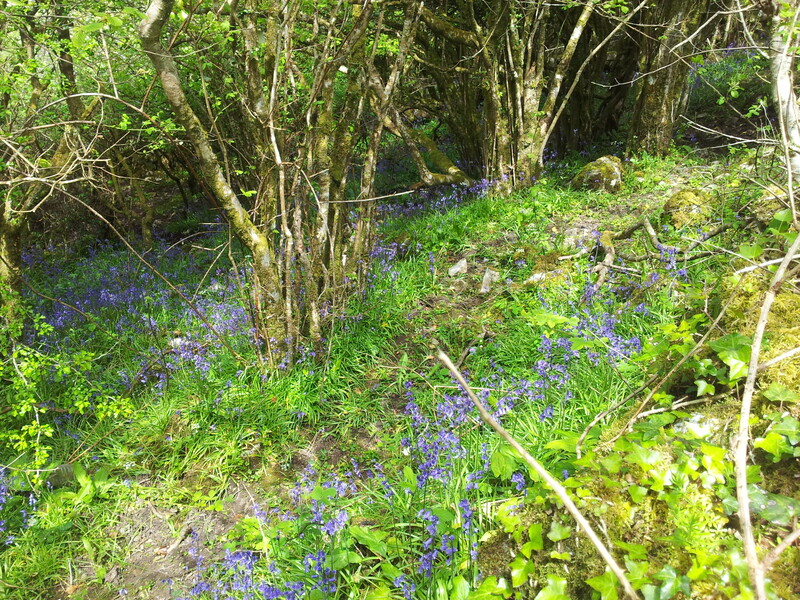 Landowners are forbidden to pick and sell the Bluebells and so attempts at breeding a sort to flourish within a commercial environment. They favour western areas and prosper best in wooded areas out of the reach of direct sunlight. This photo was taken when the ever hopeful grandchildren were out looking for pixies! You can see the carpet affect these beautiful flowers present when growing in their favoured circumstances. Associated with the weather of late spring we have finally seen them bloom in the early days of June! The sun fell behind the Grand Canal Theatre signalling the end of the weekend. The evening sun setting gave the view of the people outside a soft glow and the room inside a warm light softened by the green tint of the floor-to-ceiling windows that make up half of ely’s wall. A shared plate of exquisite carpaccio of beetroot and goat cheese salad (€7.95) started our meal off on the right foot. How can a boring old beetroot and goat cheese salad be exquisite? When red and gold beetroots are finely sliced and soaked in orange, while juicy segments of the fruit are interspersed with crunchy leaves topped with crushed toasted almonds, topped off with a creamy, mild but charming goat cheese, that’s how. It was perfect for the summery evening. An order of garlic tiger prawns with spaghetti (€17.95) for a main was perhaps a mistake, thanks to a case of mismanaged expectations. I see prawns and spaghetti on a menu and I imagine sitting at a seaside table with a plate topped with homemade pasta and unctuous, flavour bombs of fat, juicy prawns with heaps of garlic oil and chilli. Ely’s version was good, don’t get me wrong, though a touch too much lemon juice added to the lack of punch from the Tiger prawns, which could never have competed with those fat, juicy Dublin Bay suckers in my mind. It was when I had a taste of the fish & chips (€15.50) that I truly felt diner’s FOMO. 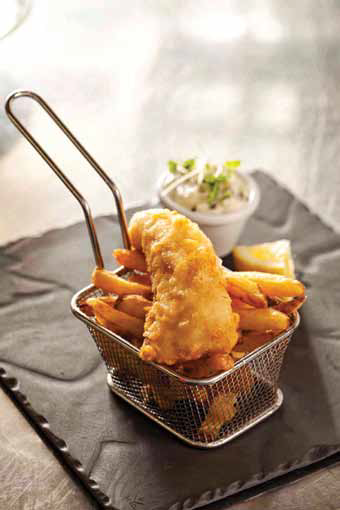 Generous portions of hake in a light, crispy batter arrived with a sweet pea puree and a little baby deep fryer basket of home-cut skinny chips – I fought hard to get my date to relinquish more than one bite. My wine went a long way to patching things up, however. A glass of Hugel Gentil reisling/pinot blanc/gewürztraminer/muscat conglomeration (€7) was expertly selected for me by the waiter. A glass of Belgian Omer Strong Gold (€7) was a good complement for the fish and chips chosen from a decent selection of 40 or so bottled beers. We shared a brilliant little dessert of light white chocolate mousse and summer berry compote that came with a deliciously sticky crumble (€6.80). With one macchiato, a bottle of sparkling water, the whole lot came to a satisfactory €69.85. In 2006, they opened ely bar & brasserie in the 200 year old tobacco and wine warehouse in the CHQ building and found themselves looking after four to five hundred customers a day from lunch to dinner, of course taking their passion for wine already appreciated at ely wine bar with them. As a three-tiered business, it makes sense that the couple bridged the gap between their first two venues by opening ely gastro bar shortly after choosing Hanover Quay as their location. It wouldn’t be wild to imagine that the couple may have questioned this choice when development on Hanover Quay and Grand Canal Square stalled. “Ely gastro bar has held its core values while we waited for the theatre and hotel to open and the area to be completed, all through the recession,” said Erik. This patience has clearly paid off. Grand Canal Square has come through the other side and has a genuine feeling of community, in which ely gastro bar seems to sit comfortably among. We left the Sunday evening revellers where we found them and figured they’d be all right, assuming that ely was their neighbourhood hangout spot and they didn’t have far to go to get home unlike ourselves. We’ll be back for a double serving of fish and chips some other summery day. If ever there was a day for rosé, this must surely be it. Rosé wines are very underappreciated in this country, often opened as a last resort or knocked back on a sunny day with little regard for its flavour or character. While it is true that rosé and sunshine complement each other perfectly, there are many dishes that are greatly enhanced by a chilled glass or two. The best tip I ever learned was this- think pink! Pink foods just seem to have a natural affinity to rosé wines – Salmon, poached and cold in a salad, prawns, lightly grilled on a bbq, paella , cured hams such as Serrano or Parma… the list goes on. The best rosés tend to come from the Mediterranean, especially south of France – Rhone, Languedoc and Provence, and Northern Spain. The wines are produced from the traditional red varieties – Grenache, Syrah, Carignan and in Spain – Garnacha and Tempranillo. But there are also wonderful wines produced around Bordeaux- usually from Merlot, sometimes Cabernet, and many in Italy – a recently tasted Sangiovese Rosé from Capezzana was an absolute delight. Outside of Europe there are some quality examples from Australia in particular. Californian Rosé found on our supermarket shelves tends to be sweet (sometimes sickly so..) and is not a good representation of what good quality rosé wine is about. Our rosé of choice is from a little known region, and a lesser known grape. Cotes de Gascogne is an region in southwest France producing reds, whites and rosés of outstanding value. Produced from the little known Egiodola grape, this is what we call proper rosé- Wonderful ripe red fruit- fresh strawberry, and red cherry – lovely freshness on the palate and a dry finish with just a touch of grip. Perfect for sipping, even better with food. Oh, and it’s not just for girls. Cotes de Gascogne 2011 is available at all 3 ely restaurants by the bottle at €27.00 or €6.75 by the glass.